When I found out that I would be attending the Yanni Voices concert, I was excited! But then I realized that I did not have a decent dress to wear. 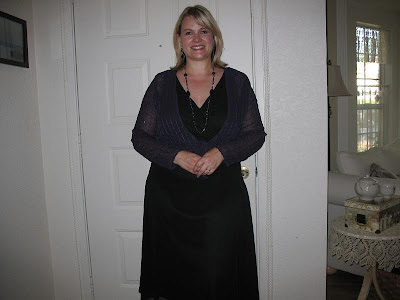 I was inspired by Jen at Balancing Beauty and Bedlam with her Frugal Fashionista post about black dresses. 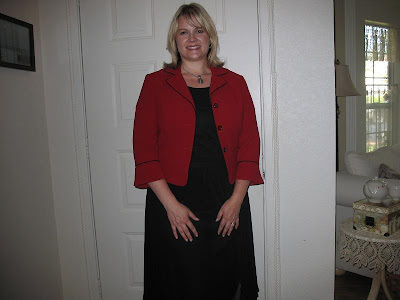 In fact, I'll be linking this post up at Jen's on Friday for her Frugal Fashionista Fashion Show! I decided to hit the thrift stores first to find the most frugal dress I could because I am losing weight (OK, v.e.r.y slowly) and thought I might not have a reason to wear a fancy dress again before the new dress would be too big (uh, fingers crossed). A few hours and four thrift stores later, I found this black dress! Perfect! And a bargain at $5.35 if I do say so myself! I thought I could make it casual by putting it on over a white tee, and adding a denim jacket, locket and sandals. I could make it look more professional with a nice necklace and a jacket. I could wear it in winter with a shirt underneath, a nice sweater, and a long necklace. I could give it more of an evening look with a sparkly purple shirt and purple necklace. 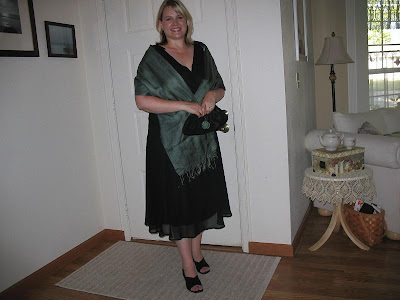 In the end, I added a scarf that hubby had brought me from India, a clutch and some heels I already had. I decided to let the scarf and clutch be the accessories and skip a necklace. I also think it may have been a more slimming choice without the necklace breaking things up. So what do you think? Fashion flair or fashion scare?! Be sure to head over to Balancing Beauty and Bedlam for the Frugal Fashionista Fashion Show! 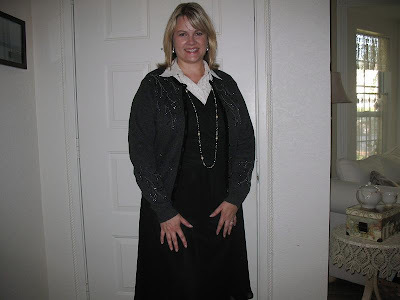 Finding a versatile and super-frugal black dress works for me! For more Works-For-Me-Wednesday fun, stop by We Are THAT Family! You know what else works for me? Having a guest post about homemade focaccia bread at Way More Homemade - please stop by to say hi and check out Donna's wonderful blog while you're at it! And one more reminder! Bloggy Friendship Days start right here and at Homesteader's Heart tomorrow (Thursday)! Get your posts ready about friends you've made through blogging so you can link those up on Saturday and spread some friendship love! You look beautiful in all the shots! I like the dress with the scarf. I have been trying to use my scarves more often myself. Very classy looking with your dress. You are so adorable! I love your fashion flair. There is nothing like a classic black dress. I think all women should have one. It's the go to dress! Big you could wear that dress all week and no one would ever know it's the same one size hugs to you! What a fun post. I think you look lovely and am delightully happy for you and your frugal find! Cute dress dahling! Well done on your thrift store find. I think you look beautiful...that is a versatile piece! If I can stay out of maternity clothes for more than 5 minutes this year, I think I'll look for one! I think they all look awesome!! Wow! So many choices for 5.35! What a great post! All those outfits for under $6...NICE. Are you still writing at Chic-Critique? 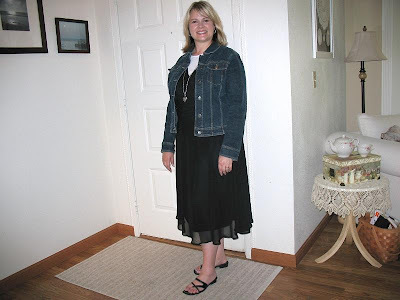 If not I think you should guest post this over there cause it is frugal fashion at its best. You look awesome in everything by the way. Maybe you should come dress me!! Fabulous! I have a wedding coming up and I am gonna hit the thrift shops soon for a dress. Hope I get a great find like yours! By the way, love the dress with the wrap and clutch! You look absolutely stunning. I think it is great that you are losing weight. We should go skinny clothes shopping together when we can't fit our older clothes. I am really glad I could finally bid good bye to my maternity wear! Oh, you look so beautiful! That IS a great dress - love the scarf especially! Really like the black dress and love how you showed its versatility! Very classy and elegant with the scarf. Looks like a great find! You look beautiful in that new dress! Lisa, I love your dress & what a lot of ways to use it. Looks great in all of them. You look very lovely. What a wonderful way to look at a dress--the OPTIONS! I need to start playing around with my clothes like this more.